This variety of the species was identified in Japan by Dr. Fumio Maekawa in 1940. It is a medium size plant about 11 inches high with a spread of around 37 inches. The foliage is medium to dark green, ovate, smooth textured with wavy margins and has thick substance. Its petioles are red spotted. Medium purple flowers bloom from late August into September. An article by Warren I. Pollock in The Hosta Journal (2014 Vol. 45 No. 2) states that, "Correctly, 'Urajiro Hachijo' should be 'Urajiro Amagi Iwa', registered in 2009. It is the white-backed (urajiro) form of H. longipes var. 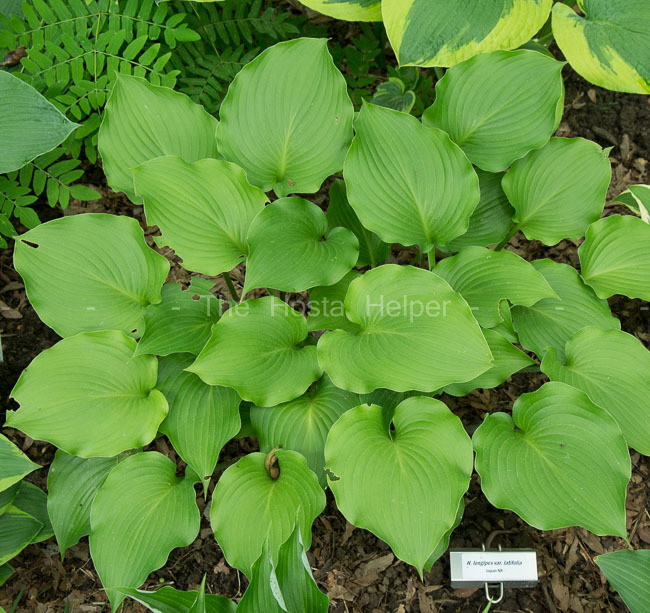 latifolia having glossy, broad rippled-edged leaves."